I bought a Baking Steel back in March; ever since, I’ve become a pizza making fool. It’s very satisfying to turn out a brick-oven-worthy crust time and time again using nothing more than my oven’s broiler and a big hunk of sheet steel. It’s even more satisfying to refine my dough-shaping skills. I used to turn out a perfectly round pie every third or fourth try. Now, almost all of my crusts are circular! Making a perfect round is significantly easier with a decent dough recipe. I keep trying new variations, discarding those too hard to shape, or with poor crunch, or insufficient oven spring to produce a puffy rim. For quite some time, I kept returning to Jim Lahey’s no-knead crust (see the recipe over at Serious Eats). But a recent experiment with my wild-yeast starter has knocked Lahey’s crust out of the top spot. Back to that crust: it is dead simple, requires nothing more than vigorous stirring, and keeps in the fridge for up to three days. In a mixing bowl or round Cambro container, stir together 145 g wild yeast starter (I keep mine at around 75% hydration, for those who like precision) and 300 g water. Add about 200 g all purpose flour; stir until smooth. Rest (aka autolyse) for 20 minutes, then stir in 300 g flour and 12 g salt. Keep stirring until all of the flour is moistened. Rest, covered, at room temperature for an hour or two. If the dough looks uneven or lumpy, give it a few stretch-and-folds after 30 minutes. (See a short video of the stretch-and-fold technique here.) Divide the dough into three pieces; shape each into a flattened ball and place in lightly oiled plastic storage containers. Refrigerate for 12 hours to 3 days. Earlier this week, I used the wild-yeast crust to make a variation on the Alsatian tarte flambee, fashioning it into a breakfast pizza. 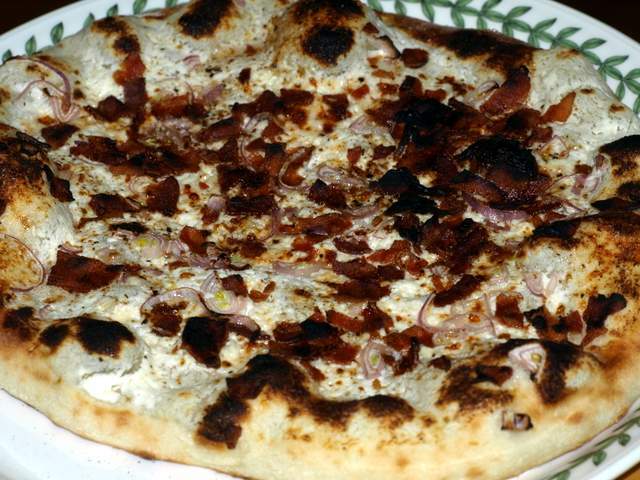 Traditional tarte flambee usually involves creme fraiche, fromage frais, caramelized onions, and Gruyere. I had none of these, so I substituted liberally. The inauthentic results, pictured at the top, were still delicious. Heat oven to 525 degrees. Place Baking Steel or heavy baking stone 6″ from broiler. Once oven reaches desired temperature, continue to preheat for 30 minutes. After 30 minutes, switch on broiler to its highest setting. Stretch dough into a 12″ circle; place on a floured pizza peel. Mix sour cream and ricotta cheese; gently spread over stretched dough, leaving a 1/2 rim at the edge uncovered. Sprinkle grated cheese evenly atop the dough. Repeat with crumbled bacon and shallots. Using the peel, transfer the pizza carefully to the heated steel or stone. Cook for 90 seconds to 5 minutes; time will vary greatly depending on broiler’s strength, steel vs. stone, and thickness of crust. Turn pie using peel if necessary for even browning. Once upper crust is bubbly at edges and beginning to char in spots, use peel to remove from oven. Cut into wedges and serve immediately. Yield: 6 to 8 slices.